Preditec offers predictive diagnostics services from its monitoring, diagnostic and training center. CMDT is a remote diagnostic center for the critical machinery of the industry. CMDT predictive analysts anticipate faults and advise maintenance managers of critical assets, who act to prevent breakdowns and produce maintenance, production and safety enhancement benefits and to avoid discharges and unwanted emissions to the environment. CMDT makes it easy for any company of any size to have a remote diagnostic center, with expert analysts providing reliable diagnostics. This is something that, to date, only large industrial groups could enjoy. 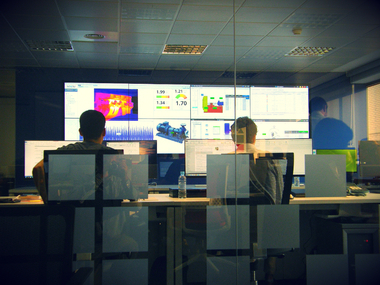 Preditec is the leader in Spain in predictive diagnostics services and one of the world leaders in the development of technologies for Cloud Monitoring. The use of the internet to communicate monitoring data of the machinery to the expert analysts who prepare diagnostic reports of the monitored machinery in order to offer the necessary information for the optimization of its maintenance. In all the industrial plants there is a set of machines that are fundamental to maintain the production. If any of these machines stops working, the economic damages to the production company are enormous. What Preditec proposes is to sensitize the most critical machines by means of vibration, temperature, ultrasonic probes ... On the monitored parameters, alert levels are established that set the moment for analysts to act, who, in the event of a malfunction, alert to the maintainers of the equipment to take corrective measures and thus avoid unwanted breakdowns and the unexpected interruption of production. The team of CMDT analysts is like a group of doctors who diagnose their patients, the machines, through the data that come from the plants. These analysts advise those who have the capacity to act in the machinery by means of revisions or repairs with precise information, both in the maximum deadlines for its execution, and on the type of fault detected. The typical faults detected are imbalances, misalignments, clearances, bearing failures, problems in electric motors and failure of gears.